General Hospital (GH) spoilers tease that the tale of two Jasons is heating up. Of course, we know there can only be one in the end. 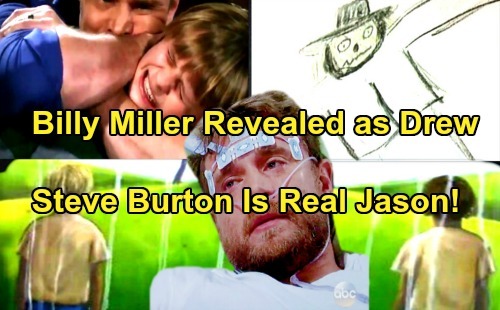 Billy Miller is currently playing Jason Morgan, but is he the real deal or the twin brother Betsy (Deborah Strang) mentioned? Based on the evidence we’ve seen so far, it seems likely that Miller’s version is actually Drew. Let’s think about all the clues GH has provided. Several characters have mentioned how much Jason has changed since he came home. Sonny (Maurice Benard), Carly (Laura Wright) and Sam (Kelly Monaco) all sense that Jason isn’t really the same man these days. Perhaps General Hospital means that Jason is literally a different person now. Drew may have walked into Sam’s life instead of Jason. Then, there’s the fact that Patient Six had Sonny’s (Maurice Benard) phone number. He obviously has a connection to his old pal in Port Charles. Patient Six also took on an angry mob of staff members at the clinic. He was pumped full of horse tranquilizers and armed with only a pen! Would anybody but the real “Stone Cold” be able to hold his own in that brawl? Current Jason has been known to put up a good fight, but Burton’s character put on quite a show in those scenes. Next, we have to consider Jake (Hudson West) and Danny’s (T.K. Weaver) song at Jason’s facility. “My old man came rolling home” was part of the boys’ chant. The traditional tune is “THIS Old Man,” but GH switched it up on us. That appears to be some fun foreshadowing. Is Danny and Jake’s old man indeed on his way home? Burton’s character will inevitably arrive in Port Charles down the road, so Dad might be coming! Think about how much drama this could cause. Jake and Danny may have been bonding with the wrong man. Would they accept Burton’s Jason as their true father? It could cause some conflict if they cling to Drew instead. Finally, we can’t ignore how long Burton was in this role. We’re talking about two decades here! Miller took over and has done a fantastic job, but it’d be easier to buy him as Drew. When GH fans see Burton’s face, it’s tough to think of him as anyone but Jason. The show even played up the Jason angle with their recent motorcycle promo. General Hospital spoilers indicate that some great material is coming up for both actors, but Burton is still the frontrunner for Jason. We’ll give you updates as other GH news emerges. Stay tuned to the ABC soap and don’t forget to check CDL often for the latest General Hospital spoilers, updates and news. 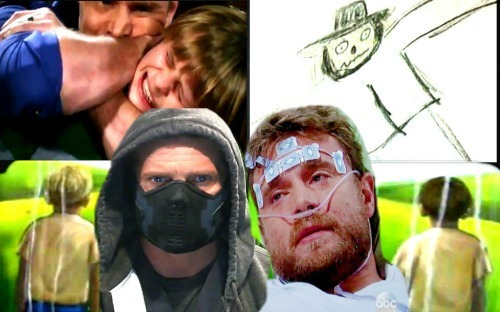 Who Is Drew – Steve Burton’s Patient 6 or Billy Miller’s Jason?